Class A power amplifier is one of the simplest types of power amplifier have high fidelity and totally immune to crossover distortion. In the standard common emitter circuit configuration, class A amplifier uses the switching transistor. The transistor is always turned ON so that the output current flows for the entire cycle of the input waveform. To control the high load current, class A amplifier may use a single power transistor or a pair of a transistor connected together. 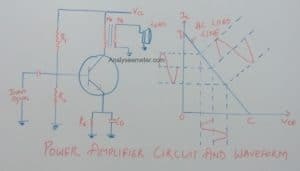 In our previous article, we explain power amplifier circuit, semiconductors, diodes, rectifiers in detail. Here we are going to explain Class A Power amplifier efficiency equation, advantages, and disadvantages in detail. 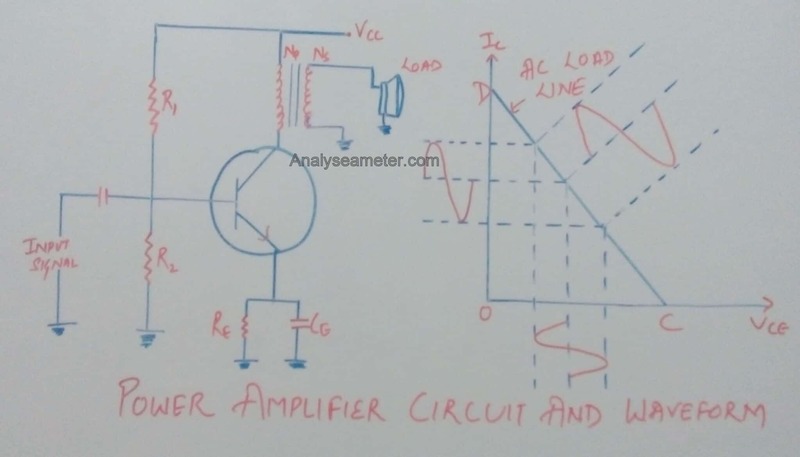 Class A amplifier configuration is the simplest of all the power amplifier configuration because there is no switch off distortion to the output waveform even during the negative half of the cycle. As shown in circuit diagram below, a load is connected in the collector circuit either directly or through a coupling transformer. Usually, the load is connected through an output transformer because it provides the perfect impedance matching due to which maximum power can be transferred to the load and keeps the DC power loss small because of small resistance of the transformer primary winding. As we know, at zero signal conditions the effective resistance in the collector circuit is almost zero, since the primary winding resistance of the transformer is very small & can be neglected. As shown in its waveform, a line passing through the Vcc & parallel to the axis of collector current Ic is known as DC load line. Draw the AC load line by cutting the DC load line at Q (operating point) such that Q lies at the centre of AC load line. To obtain maximum AC power output and hence maximum collector efficiency, the peak value of collector current due to signal alone should be equal to zero signal collector current. RL’ = Effective value of load resistance RL when referred to primary side. Note: Before selecting a transistor always remember that its power rating be >= Pdis. 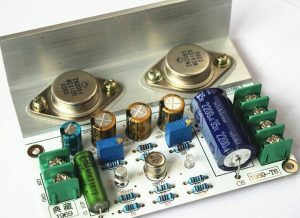 In the electronics industry, we use power amplifiers for various purposes depending upon the requirement. Each and every amplifier has its own pros and cons as per its reliability and efficiency. It has high fidelity because at output exact replica of an input signal is produced. It has improved high-frequency response because the active device is On full time i.e no time is required for turn on the device. Single ended configuration can be easily & practically realized in class A amp. Due to the large power supply and heat sink, class A amp are costly and bulky. Due to transformer coupling frequency response is not good.